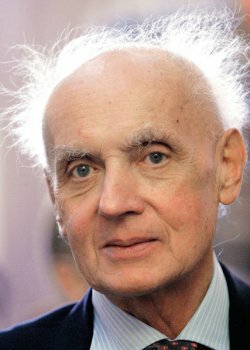 Wojciech Kilar was born on 17 July1932 in Lwów, Poland (nowadays Lviv, Ukraine). He comes from a generation of composers who learned the craft of composing through traditional music studies. In these early days of his career he wrote experimental music, joined by Penderecki and Gorecki. Together they became part of Polish avant-garde movement, also called the period of Polish sonorism. It began halfway through the 1950´s and ended in the beginning of the 1970´s. There were other composers like them, but none of them nearly as important. Unlike the other two composers Kilar fully combined his experimental concert hall writing with writing for film beginning in 1959. One of the best examples of the avant-garde period was a work called Riff 62, a modern 12 tone piece music. This piece showed how Kilar broke with all kinds of tradition: influences of contemporary (jazz) music, neglecting social realism and the incorporation of several encores during its premiere. In 1972 Kilar adopted different music ideas and used folklore for a source in writing Przygrywka i kolęda. He said farewell to the sonorism and began to draw inspiration from traditions and folklore. In 1974 the composer wrote the symphonic poem Krzesany, which is considered his most iconic work and the ´real´ departure of a different kind of career. Important in his change was the use of a minimal musical approach. His musical language changed and became more lyrical, simplied and direct. Polish traditions found their way onto notable concert works such as Siwa Mgła (1978) and Choralspiel (1988), while religious inspirations where found in works such as Victoria (1984) and Hymn Paschalny (2008). The composer believed his film music could rarely match the quality of his classical music he wrote for the concert hall. Some scores or merely a cue could really become worthy of performance in a concert hall. Amongst these known exceptions were Requiem for Father Kolbe (based on his score to Życie za Życie) and The Portrait of a Lady. Regardless of this believe, much of his is film music held close resemablance to his concert pieces. Both his classical and film music has consequently been of high standards. He wrote music for over more than 140 films. A greater part of his film music resume consists of European scores and some overseas. Some of his most notable collaborations were with the Polish directors Krzysztof Zanussi, Andrjez Wajda, Roman Polański and Krzysztof Kieślowski. Zanussi and Kilar maintained a fruitful partnership. Surely, Zanussi gave Kilar the opportunity to build up an impressive career in the film genre. They collaborated on more than 40 films, including television productions. Many of the scores shared a great emotional depth and often counterpointed what was seen on the screen. This is evident in a score such as Bilans Kwartalny (1974). The theme is simply structured and the piano and strings evoke a great sense of melancholy. Another notable score was the hugely inspiring music Kilar wrote for Życie za Życie (1991). It includes a cue called Father Kolbe´s Preaching, which is one his most famous themes. The films by Zanussi have frequently had this kind of unemotional feeling, in which Kilar could often find the opportunity to write something to make the emotions more feasible. Życie za Życie and From a Far Country (1981), both coincidentally dealing with religious themes, were different and both were a bit larger in scope in terms of visuals and emotions. This made these relatively more expressive than was the case with other collaborations. The music to Cwał (1996) mimicked the movements of galloping horses, a technique the composer rarely used. The composer wrote the score to six films directed by Andrzej Wajda. Their first collaboration was in 1975 with the film Ziemia Obiecana. The score features an enchanting waltz, which was written for the romantic moments of the film. A year later he would write a similarly attractive waltz for the film Trędowata by another director. For Zemsta (2002) he wrote passionate mazurka and a memorable polonaise for Pan Tadeusz (1999). Kilar had a rare gift to write the kind of dance music that would enter into the collective memory of many people. When compared to Zanussi films, he was able to write more expressive music for Wajda films in general. Most of their themes were written in his typical mode of repition, unlike Smuga Cienia (1976). While undeniably having written an appropriate theme for the project, the film did not allow Kilar to give his theme the kind of full treatment. He felt that the characteristic repitions of themes in many of his scores allowed them to evolve into something more emotional. Besides having written mostly for Polish cinema, Kilar has also tackled numerous of works for German, English and French films. Of his German works the mini-series König der Letzten Tage (1993) was his most prolific work, effectively using a large scale orchestra and choir. This kind of ´larger than life´ feeling was also evident in Dracula (1992), the score that gained him international fame. His most unexpected turn was for the French animation film Le Roi et l’Oiseau (1980), for which he wrote a different type of animation score. It followed the route of semi-classical music and included a sonata and polka. In recent days the composer suffered from the consequences of cancer. The composer died on 29 of december 2013, in the comforting surroundings of his hometown Katowice, Poland. Wojciech Kilar was an intelligent composer, leaving behind an impressive legacy, both in the fields of classical and film music. I offer my commendation for an excellent testimonial. Well done sir, well done!